Transform your room with freshly printed Wallmonkeys animal wall decals. We have the largest selection of photographic wall decal creatures and animal wall stickers online. Access thousands of wildlife photographs and inspired prints of a variety of animal species. Choose from animal wall clings in the form of vector cartoons, illustrations or photo-realistic creatures. Our premium vinyl material and superior ink guarantee you the highest quality adhesive wall decor money can buy. What makes Wallmonkeys animal clings the best? - Every animal decal is custom printed, one at a time, just for your wall, in Gaithersburg, Maryland, USA. We use the highest quality printers, ink, and materials available. They are easy to install, and easy to remove. 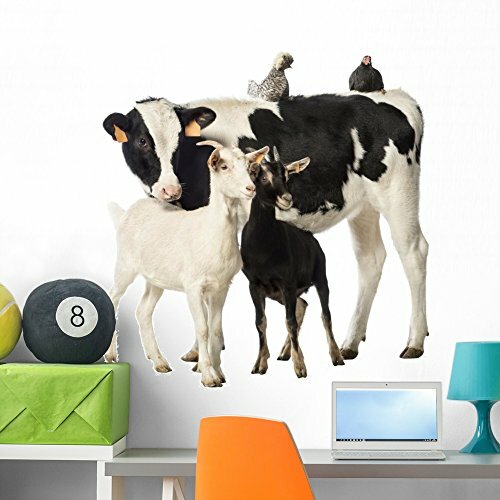 Wallmonkeys has the largest selection of peel & stick animal wall decorations on Amazon. Decorating your home has never been easier with hundreds of thousands of images to choose from. Have you measured your wall? These adhesive animal graphics are available in a variety of sizes and prices. Please double check the size before placing your order. Our Wall Stickers are printed on-demand. Our wall decal stickers print and ship within 1-2 business days. Wallmonkeys animal graphics are meant for indoor use. The material is not designed to be waterproof, but Wallmonkeys last quite well under mild weather conditions. Before installing outside, please clean the area before installing. Please do not use chemicals.